Our TheGearHunt score is based on 3 different factors: Editor's rating after in-depth testing. User ratings submitted on this page Overall score from the "reviewmeter" based on reviews across the web the weight of each factor is: 40% editor rating 15% user ratings 45% reviewmeter. Any product that is reviewed has people who like and dislike the features. 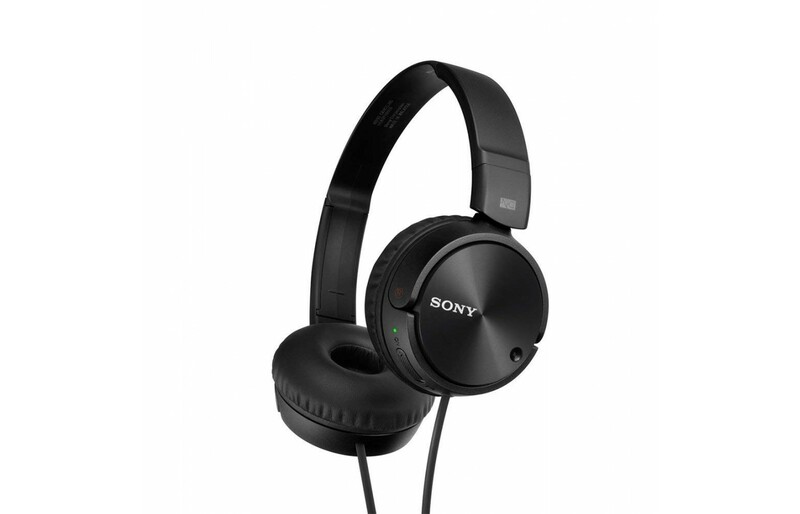 The Sony MDR-ZX110NC has those who feel it is a quality product and those who think it is not. Opinions and tested data is being presented. Headphones were made for people in a noisy situation while trying to do homework, work at a job, or just trying to think. The problem is they are big, bulky, and can’t be taken everywhere, not to mention many are quite expensive. Sony has noise canceling headphones that reduce 95 percent of ambient noises. They are small and compact. Their folding style and adapter for airplanes allow them to be taken along when traveling. They produce balanced, clear, and high-quality sound. The headphones are useful for travelers who don’t want to spend a ton of money but don’t want something to go into the ears. People who want to hear a more aggressive punch would likely choose another set of headphones. Noise cancellation is a big deal when trying to concentrate, do homework, or whatever is trying to be accomplished. The headphones are especially useful for cash strapped college students. They can be purchased for a price between $40 to $50. The headphones allow users to find their zone and be able to concentrate and do their work. The essay can be finished at the last second. The Sony MDR-ZX110NC has decent sound quality for vocals, instruments, and critical listening. Even though it lacks some clarity, there is an adequate bass punch. They lack detail that quality critical listening headphones provide and have a poor soundstage. Not everyone agrees that the headphones are ideal for commuting. Some feel the small ear cups fail to prevent ambient noise efficiently. In the areas of sports and fitness, the headphones are subpar. They are not stable enough to use while jogging. The control leaves something to be desired. The non-detachable cable might be bothersome while doing strenuous exercise. 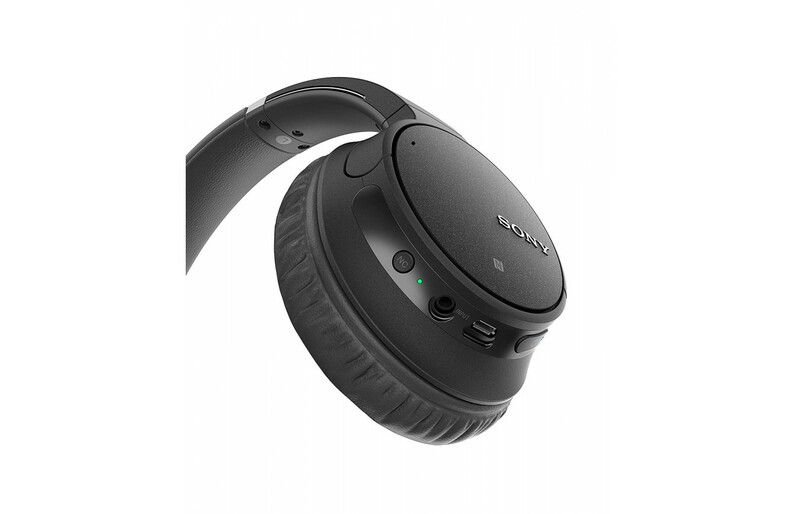 For office use, the Sony MDR-ZX110NC doesn’t block ambient chatter from seeping into the audio. Their best use might be watching videos. The headphones have no latency due to the wiring and decent sound. A short audio cable keeps the headphones from being comfortable while watching movies from a couch unless the user has a line-in extension cord. There is no app support or mic to use for gaming. The relatively short audio cable range is also limiting. The package includes a pair of wired headphones, a battery, an airplane adapter, and instructions. The box indicates the headphones have a 95 percent noise reduction. They come with a travel adapter that can be used onboard planes and a battery to power on the noise canceling feature. The quality of sound is hard to evaluate. According to one of three testers, without the canceling feature, there is an extreme treble sound with little to no bass. However, when the noise canceling feature is on, the sound quality is better and brings a lot more bass. The headphones produce a weird feeling when they are on without the noise canceling feature. Low-End frequencies can be heard and felt. When itis on, the low-end frequency drops to the point that it can’t be heard, but the wearer can feel it. The results may be due to the noise cancellation, or the battery may help push the audio out. It sounds better when the noise cancellation is engaged. The testing was conducted in a quiet room. Simulated jet noises and crowd of people noises were used to test the sound quality. Without noise cancellation and music turned to the max, jet noise was not heard. Turning the music down made hearing jet noise clear as day. When cancellation was on, it canceled out all but a little of the jet noise, but the music did not sound as deep and rich as it had previously. The sound of the jet is just a bit of high noise. The music can be heard more clearly when the noise canceling is used without the sound of the jet noise blaring. The headphones are not as effective canceling out crowd noise as jet noise. Jet noise is a continuous, constant sound whereas; crowd noise is ever changing. It is easier to hear music when the noise canceling is on. The sound, according to the third tester, is the same as that of other headphones when the noise canceling is off. When engaged, the sound quality is much clearer. The bass is full, and there are all sorts of ranges of frequencies that are heard that might otherwise be missed. With noise cancellation on, the sound is excellent; with it off, the music is not so good. When placed on a monitor, the Sony MDR-ZX110NC was found to be an average sounding set of on-ear, closed-back headphone. They have powerful and deep bass, a mid-range that is well-balanced, and an even treble. The treble range has a massive bass range and a treble range that is veiled. Those who like bass-heavy genres such as Hip-hop and EDM give the headphones a positive rating. People who prefer vocal-centric or classical music would not find the headphones as the ideal choice. The headphones are not wireless. They have a non-detachable cable with no in-line remote. Bluetooth does not support the headphones. They come with a battery for the noise canceling feature. It is inserted in the headphone by opening the right ear cup. There is a dimple on the side to press to pop open the lid. After inserting the battery and returning the lid, the noise canceling feature can be used. Wires are attached to the headphones. The headphones have a ⅛ TRRS connector. Audio is provided only when connected to audio devices such as console controllers or phones. There is almost no latency because the headphones are wired. They lack the available range that wireless headphones have. Some reviewers feel the headphones sound fantastic; appreciate they are foldable, and can be put in a backpack, purse, or large pocket; and like that the wire is connected to the headphones. There are no batteries to charge, or concern about pairing to Bluetooth. The inside of the ear cups eature 30mm drivers which are decently sized, and the ear cups are cushiony. The headphones offer somewhat small earcups that sit on the ears. Testers say wearing them is not a pleasant experience to match how cuffs feel that cover the ears. Compared to gaming headphones, the cuffs do not cover the ears. The headphones are on-ear rather than over-the-ear. Reviews expressed different opinions about the level of comfort. Because they are on-ear headphones, they are small and more compact than over-the-ear headphones. They are not stable on the head. The all-plastic design is poorly padded. Not being too tight adds a bit to the comfort level. The headphones weigh 0.33 pounds. They have a clamping force of 0.72 pounds. 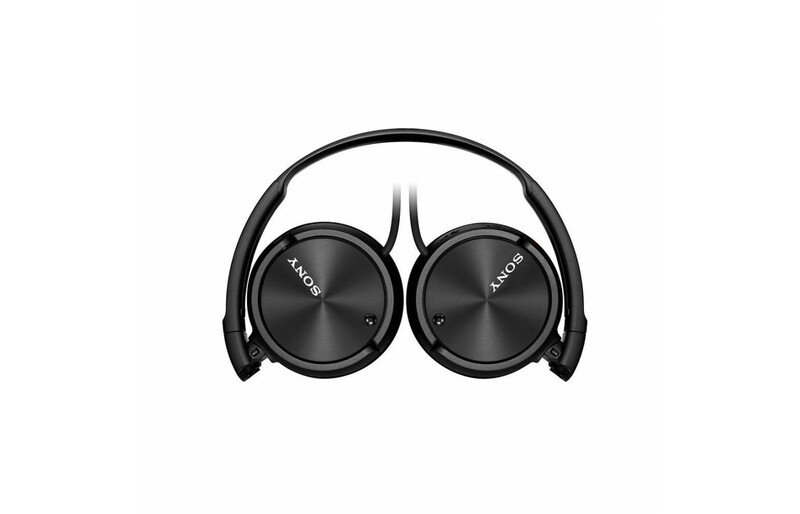 The Sony MDR-ZX110NC has a lightweight design that does not exert excessive pressure on the ears. Stiff ear cups and lack of headband padding make them a bit uncomfortable. Not everyone likes the small on-ear design of the ear cups. The on-ear headphones are relatively breathable. The ears are not entirely covered. They don’t obstruct as much airflow as over-ear designs. 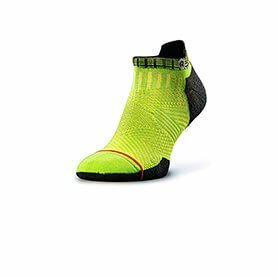 The breathability would be useful for sports, but the poor stability is not suitable for exercising and running. Nothing remarkable is offered when it comes to style. The color scheme is a matte all-black color. The only flair is the stylized back cover of the ear cuffs. These headphones don’t stand out, but the understated style works for some. The Sony MDR-Z110NC is a decent-looking set of headphones. The headphones are covered in plastic. Because the headphones are made of plastic, they are very lightweight. Lightweight can be a positive feature or make the headphones feel cheap in quality. They are a bit small. 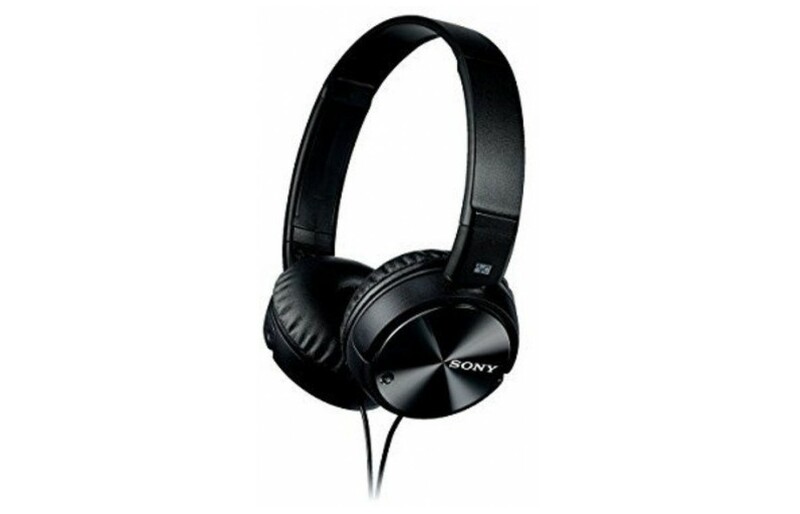 The on-ear Sony MDR-ZX110NC Sony MDR-ZX110NC headphones are above-average in portability. They can be conveniently folded up into a compact format. They can be carried around in a purse or a large pocket. The packaging for the headphones is wrapped in clear cellophane that tears off easily. There is a tab to pull to open the box so that it does not tear. Another tab allows the headphones to be removed out of the box. It slides out with ease. The headphones are warped in a plastic-like bag. A battery and adapter are included in the package. The headphones sit in a plastic shell. The headphones are covered in plastic. Though expectations were low, a tester tells us the headphones the plastic headphones are solid. They are not extremely flimsy which means they won’t break easily. The cable has a feel of decent quality. It is neither too rubbery or hard. The headphones allow plenty of movement. The quality of the headphones is below-average. A thin headband and all-plastic design looks cheap and does not have a durable feel. There is fear the headband will snap under moderate stress. Unique hinge mechanisms are weak points to a design that is fragile. The headphones can be used with the power switch is set to ‘off’ which is excellent if battery life is trying to be saved or the battery is dead. There is an on and off switch on one of the ear cuffs to use for noise cancellation. Pushing the dimple causes the lid to pop off. It snaps back on after the battery is inserted. One reviewer was afraid the access could be pushed accidently when putting on or taking off the headphones. The headphones have foldability. They are folded in the packaging. The ear cuffs are turned to fold and unfold the headphones. Folded that are nice and flat. They would fit into large pockets. The size can be adjusted by pulling and pushing the headpiece. Functionality and button layout are disappointing. With only one switch for noise cancellation, there is no control over the audio. The noise cancellation feature runs on a triple-A battery. The battery is good for approximately 80 hours of noise cancellation. The drivers inside these headphones are thought to give better power than an iPod, phone, or laptop. The MSRP IS $89. That price point is pushing the envelope for a set of headphones of this quality. Amazon sells them much cheaper. They do not cost an arm or a leg. The under $50 price tag of the Sony MDR-X110NC noise canceling headphones is an enticing feature. The headphones may be the cheapest noise canceling headphones available. At that price, expectations of the product are not high. With noise cancellation, the users get 80 hours of quality music. On their own, the headphones aren’t that great. People are not likely to buy them for the sound, but the noise canceling is pretty interesting. When the noise canceling is on, some things can still be heard such as people talking straight at the user. Everything else like the sound of a fan going, cars on the street or a plane flying by are not heard. The Sony MDR-ZX110NC delivers decent sound but mediocre mixed usage. The only benefit of the headphones is the sound quality when the noise canceling is engaged. The headphones are almost completely made of plastic. They feel as though they are cheaply built. The headphones are a budget item for casual recording or listening. They lack features that make them versatile enough to be used for all cases.